A group of Cree youth are beginning the final leg of their walk from Northern Quebec to Parliament Hill. 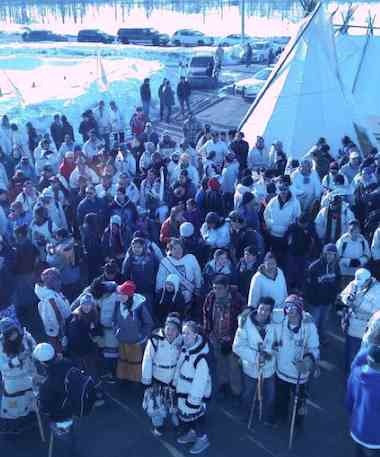 Six youths and a guide set out in January to snowshoe and walk to Ottawa in support of the Idle No More movement. But the walk now includes hundreds of people. “It’s helping them deal with personal struggles, including depression and suicidal thoughts,” said an 18 year old, one of the original seven walkers. They will have covered 1,600 km when they reach nation’s capital later this morning. Photo was Posted on Twitter by CBC Ottawa’s Ryan Paul Gibson, from their final resting point in Chelsea, Que.